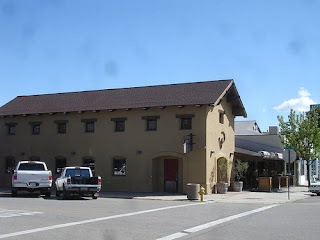 Villa Creek Restaurant is located at 1144 Pine Street in downtown Paso Robles. You must visit this place! It is so cute. I have to admit, I don't frequent the downtown portion usually because I am barreling down the 101 to my next adventure. 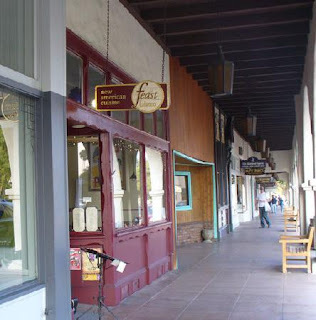 Tucked on a lovely corner facing the park you will find Villa Creek. An Italian place located within the South Point. It was empty and we said - ok! Serve us, serve us now! We are hungry! 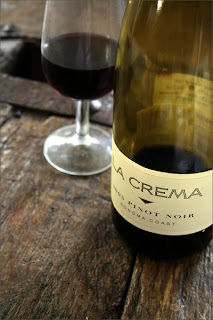 Both familiar with La Crema Pinot Noir - Scott and I both ordered a glass! Cheers! 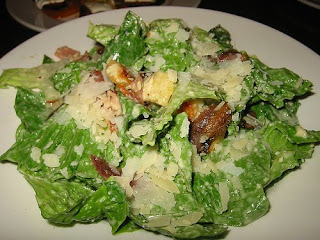 Our entrees both came with a Caesar salad. Very nice, very garlicky. My entree was up first. I love fish if you have not noticed by now, the South Point has always had an incredible selection. 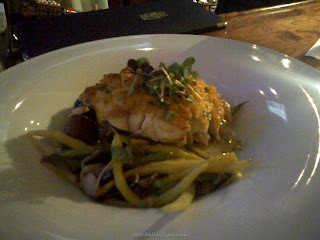 So when I see the Garlic crusted Sea Bass on the menu I am sold. It was fantastic! Too large of a portion for me, I ate until I was totally full. 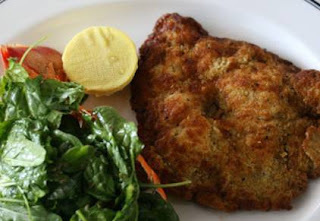 Scott ordered the Lobster Milanese which was breaded, pan-fried and served with lemon butter sauce. This too was extremely delicious. Pleasantly surprised! 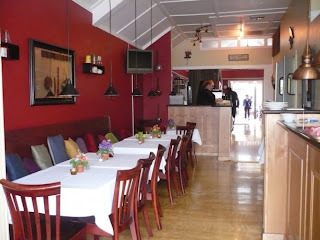 I am not normally a noodle fan, which is how I describe an Italian restaurant, but this place was ok! Not probably the most authentic meal I have had but it did its job. A decent meal among all the nachos, popcorn and candy I had ingested while in Vegas. Would I return? Yes. It is a touch pricey but then again, everything is in Sin City. You pay one way or another! 1.5 thumbs up for a beautiful meal. While staying at the South Point Casino for the NCHA Millionaire Aged Event I found myself frequently visiting the Oyster Bar and enjoying the Clam Chowder. 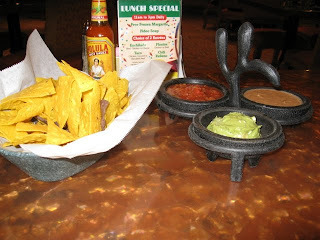 But Friday afternoon I just could not take it anymore and decided I needed Mexican food. I am a true lover of the stuff. Their Lunch Special was a good one. 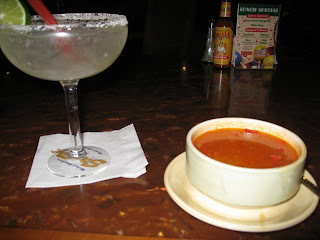 A Margarita, Fideo Soup - whatever that was - and two entrees. What a heck a deal! I order that and got my drink and soup. The soup was not too bad. In fact I felt it was a high point of the meal. Sort of like a tomato broth with angel hair noodles. Interesting. Yet, satisfying all the same. The best part of the meal was by far the Chips and the Trio. Salsa was average, pretty sure straight out a bottle. Guacamole, my love! And the beans that were just beans, but sometimes that is ok. Yummo. Should have just stuck with this. So this is it. The main event. Looks like a fiesta on a plate right? Wrong! Oh so wrong. This is not like any Mexican food I have had before. The enchilada sauce tasted like tomato water. I am very picky about enchilada sauce, obviously. 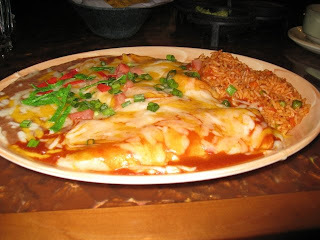 The chile relleno which is hiding underneath all that cheese was actually pretty good. I had to dig deep to find it though. Rice was another downer. 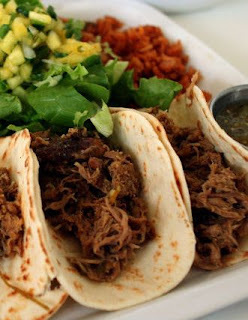 Forget about that carbohydrate during this meal. Eat more chips! In fact request more guacamole! I am just such a Mexican food snob. I have been surrounded by the stuff since birth. I know the good from the bad and this is just your average Mexican food. I am sure they have lovers of the stuff but it just failed to hit the mark for me. I will probably come back because I foresee frequent visits to the South Point with my cutting adventures. Will I miss it until next time? Nah, don't think so. One thumb up for slammin' lunch deal, quick service and for it being in Vegas baby! I love you, I really do... but I think it is time we break up. We have really had a good run. I have loved you since a young girl, especially in a bread bowl so I could so gracefully do the dip with your top and sides. My earliest memories of you are in a big shell from the Fisherman's Grotto on the Wharf in Monterey. You were just as delicious then as you are now. 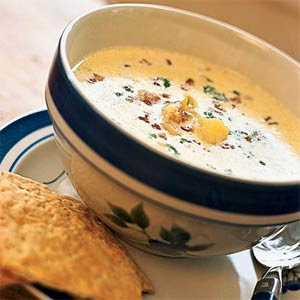 My favorite Clam Chowder is full of cream and butter, not too many potatoes and lots of salt and pepper. My jeans are getting tight and it is all your fault. You are just too wonderful for me to have in moderation. So the time has come, we must part ways. 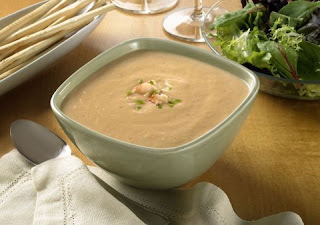 It was a good ride Clam Chowder. It really was, I will miss you. Don't call, it will just make this harder. 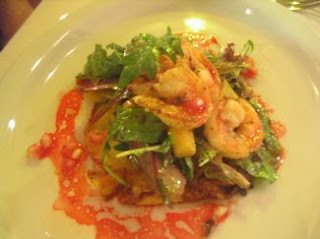 The appetizer was a corn cake (under the greens) with grilled shrimp. It was very tasty and a perfect start to our meal. The Fish Special is what caught my attention. 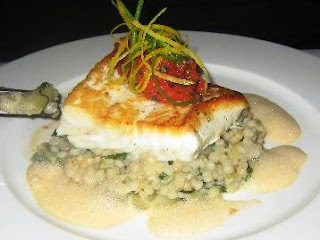 Halibut resting on a bed of risotto and vegetables. Yummy. Scott ordered this as well. We both agreed they served too much risotto - who complains about too much food! Silly! The fish was cooked perfectly and I thought it was a wonderful meal. Dessert was ordered but not really worth mentioning - something like apple cake. It was too sweet! And a touch too heavy following our extreme risotto consumption from earlier. We had asked the waiter to surprise us with something, and that was his selection. We should have just went with the Creme Brulee! Anyhow, it was a wonderful dinner all the same. A touch pricey but well worth the experience. One and a half thumbs up.